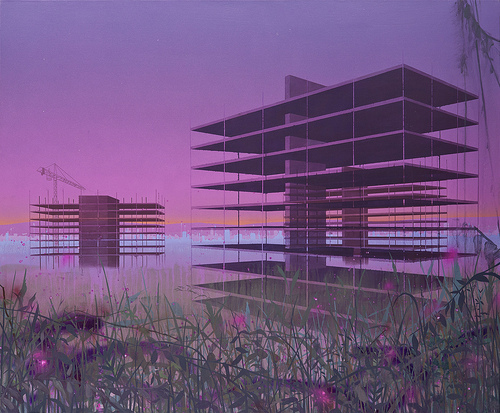 Robert Minervini, "A Necessary Ruin," acrylic on canvas, 50 x 60"
Minervini’s world is post-apocalyptic: shells of finely rendered, multi-story buildings hold court over an otherwise structure-less landscape that is filled only with shrubs, grasses and marshland. Trees are noticeably and suspiciously absent. Luminous multihued skies — oranges and pinks, blues and yellows — place the scenes at the beginning or end of the day, a visual metaphor for the larger “end of days” message. But these works are more hopeful than full of doom; they are very sparsely populated with humanity, small flowers are in bloom. The tone is of rebuilding and regeneration. These structures are new, as indicated by the presence of a crane in one work, placed far in the distance, and the fact that they are whole and show no signs of wear. Moriyama’s world, comparatively cartoon-like, primary-color bright, and fantastical, features intricately networked communities or cities that appear to be controlled by a single or just a few, central figure-head(s). The big brother/government-oversight message is clear. Nature and technology appear as if enmeshed, equally holding things together and pulling them apart. If Minervini is reflecting on what a recovering world will look like after a catastrophe and Moriyama is providing us a view of a future without one, neither world is exactly a view of paradise. The elements and themes here actually don’t veer far from today’s world: the future may be closer than we think.